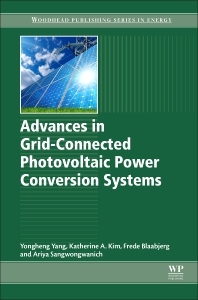 This book includes extensive, step-by-step practical application examples to assist students and engineers to better understand the role of power electronics in modern PV applications and solve the practical issues in grid-connected PV systems. Yongheng Yang received the B.Eng. degree in Electrical Engineering and Automation in 2009 from Northwestern Polytechnical University, China and the Ph.D. degree in Electrical Engineering in 2014 from Aalborg University, Denmark. He was a postgraduate with Southeast University, China, from 2009 to 2011. In 2013, he was a Visiting Scholar at Texas A&M University, USA. Since 2014, he has been with the Department of Energy Technology, Aalborg University, where currently he is an Assistant Professor. His research interests are focused on grid integration of renewable energy systems, power converter design, analysis and control, harmonics identification and mitigation, and reliability in power electronics. Dr. Yang has published more than 100 technical papers and co‐authored a book – Periodic Control of Power Electronic Converters (London, UK: IET, 2017). Dr. Yang is a Member of the IEEE Power Electronics Society (PELS) Students and Young Professionals Committee, where he serves as the International Strategy Chair and responsible for the IEEE PELS Students and Young Professionals Activities. He served as a Guest Associate Editor of IEEE Journal of Emerging and Selected Topics in Power Electronics and has also been invited as a Guest Editor of Applied Sciences. Katherine A. Kim received the B.S. degree in electrical and computer engineering from the Franklin W. Olin College of Engineering, Needham, MA, in 2007. She received the M.S. and Ph.D. degree in electrical and computer engineering from the University of Illinois, Urbana‐Champaign, in 2011 and 2014, respectively. She has been an Assistant Professor of Electrical and Computer Engineering at Ulsan National Institute of Science and Technology (UNIST), Ulsan, South Korea, since 2014. Her research interests are power electronics, modeling, and control for photovoltaic and renewable energy systems. Dr. Kim received the National Science Foundation’s East Asia and Pacific Summer Institutes Fellowship in 2010 and Graduate Research Fellowship in 2011. She served as the Chair of the IEEE Power and Energy Society/Power Electronics Society (PELS) Joint Student Chapter at the University of Illinois in 2010–2011 and Co‐Director of the IEEE Power and Energy Conference at Illinois in 2012. She served as the IEEE PELS Student Membership Chair in 2013‐2014 and is an IEEE PELS Member‐At‐Large for 2016‐2018. Ariya Sangwongwanich received the Ph.D. degree from Aalborg University in 2018, where he is working as a Postdoc Fellow at the Department of Energy Technology. His research interests include the control of grid-connected power converters, photovoltaic systems, reliability in power electronics, and high-power multilevel converters. Dr. Sangwongwanich has published more than 20 technical papers in the aforementioned areas.